The Shamrock Summit was a summit meeting that took place in Quebec City, Quebec, Canada during March 1985. 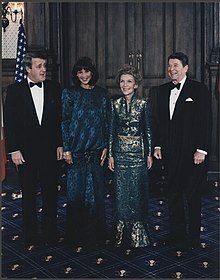 It was a meeting between Prime Minister of Canada Brian Mulroney and President of the United States Ronald Reagan. It was nicknamed the "Shamrock Summit" because both leaders had an Irish background. The meeting is well known because both leaders began to sing the song "When Irish Eyes are Smiling". ↑ Thompson, John Herd; Randall, Stephen J. (2010-05-31). Canada and the United States: Ambivalent Allies. University of Georgia Press. p. 265. Retrieved 2014-01-14. This page was last changed on 8 July 2018, at 02:26.